Be the Boss of Your Thoughts! A Guide to Reduce Anxiety and Lower Stress in Kids introduces three funny friends to explain the three levels of brain processing. When children understand how their brain functions, they can begin implementing simple exercises to change anxious thought patterns into healthier ones. 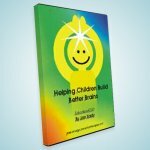 Ending with exercises to lower stress and anxiety, this book is a wonderful resource to empower children to “Be the Boss of Their Thoughts”. 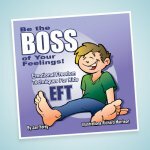 Be the Boss of Your Feelings, the Emotional Freedom Technique (EFT) for Children is Jan Yordy’s debut children’s book. This informative book introduces children to the body/energy/emotion connection and explains how EFT can be used to tap away negative feelings. 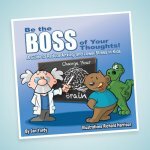 The engaging illustrations and helpful information provides a wonderful tool for encouraging children to become the “boss of their feelings”. Parents, educators and therapist will love this new resource for helping children! Helping Children Build Better Brains is a two hour, educational DVD created to help parents, educators and therapist understand new research and complex information about brain development and the growing problem that neural toxins are creating for our young, sensitive children. Learn how to grow neural connections through Brain Gym® exercises and to understand children’s learning style, simplifying their learning process. Ups and Downs with Feelings is a game designed to help children talk about and process uncomfortable feelings. Following a spiral path the players have opportunities to talk about feeling faces they encounter along the way. If they land on a happy face, they can talk about their positive feelings and then follow the arrow up a level. If they land on a negative feeling face, since uncomfortable feelings can make anyone feel down, they talk about their yucky feeling and then follow the arrow down a level. The player then chooses from 4 different therapeutic options which can transform their negative feelings and help them feel better. Shrinking their negative feeling allows them to move back up to where they started and continue on in the game thus learning positive coping strategies which they can use in their daily lives. 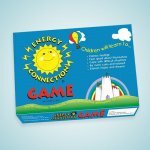 Energy Connection is a fun, cooperative game, which helps children talk about their feelings & develop positive coping strategies. It incorporates information & activities from Brain Gym, Energy Medicine, EFT & EMDR. Designed for children starting at age 5, it has been successfully used with children in therapy, families or small school groups. A comprehensive manual comes with the game and a 3 hour and 45 minute informative DVD explaining the game and related exercises is also available. Kids of all ages love to play this game and learn effective ways to deal with their feelings while they play! 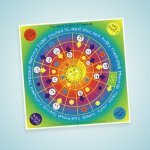 Feeling Toss Game contains a colorful chart made up of 8 different feeling faces and a suction cup ball to toss at the chart. When the child hits a feeling box, they are invited to describe a time they felt that feeling. 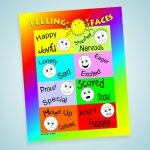 This provides a wonderful “check in” which encourages communication about a variety of feelings. When used frequently, it helps children to become more comfortable thinking and talking about their feelings. Jan Yordy (MSW, M.Ed) has been working with children since 1973, first as an elementary teacher and later as a counsellor and play therapist. Since 1998, her practice has expanded to include work with teens and adults, using EMDR, a range of energy psychology techniques, Brain Gym®, and Neurofeedback.